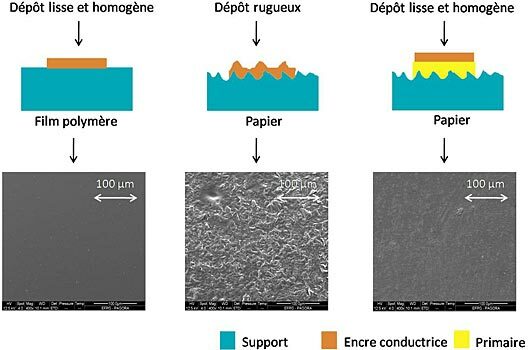 Grenoble INP-Pagora, The International School of Paper, Print Media and Biomaterials is supporting the creation of a young innovative company, Poly-Ink, which is part of the emerging industry of printed organic electronics. 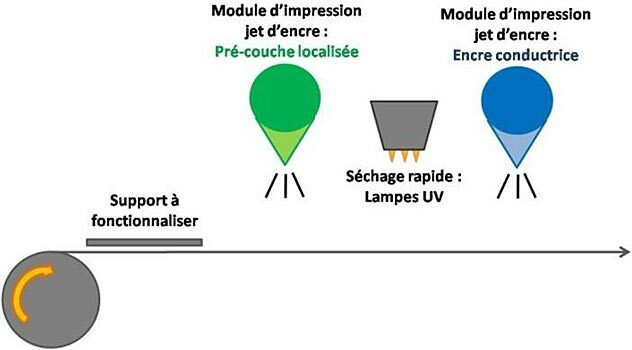 Born at the initiative of Polypore, founded in 1987 by Charles Neuman, Poly-Ink is the result of work carried out in collaboration with the school laboratory (LGP2) in the framework of a CIFRE thesis conducted and defended by Aurore Denneulin in 2010. Ms. Denneulin is also a 2007 engineering graduate of Grenoble INP-Pagora. Supervised by Anne Blayo and Julien Bras, this work focused on the development of conductive inks dedicated to the inkjet printing process. The very innovative results obtained after three-years of collaboration resulted in the filing of a patent in 2009. Since March 2010, the project team benefits from the support of the business incubator GRAIN (Grenoble Alpes Incubation) in order to develop its discoveries and establish the start-up Poly-Ink. A laboratory support fund (FAL) from the Rhône-Alpes region and from Grenoble INP promotes this incubation in the premises of Grenoble INP-Pagora. This start-up manufactures and distributes products – conductive inks and photo-polymerizable primers – developed specifically for the printing of electronic components by the inkjet method. In the printed electronics’ field where the photolithography process was traditionally used, inkjet inks are advantageous in more ways than one. This non-contact and direct writing method (without printing form) is simple to integrate into any production line. In only one step it allows high resolution quality custom printing over a wide range of media. In addition, unlike photolithography (subtractive process), inkjet (additive process) does not require polluting materials to manufacture electronic structures. The advantages of Poly-Ink are also related to the materials used. Indeed, the company develops products that combine high-technicity, low environmental impact and reduced production costs. 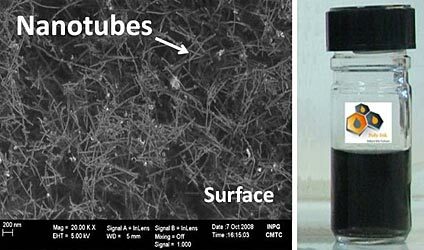 Its conductive inkjet water-based ink combines good “processability” of a conductive polymer to the high conductivity of carbon nanotubes. The materials in this ink are synthesized and do not rely on exhaustible resources such as inorganic metallic inks. In addition, their major interest is that they do not require annealing to be conductive. Therefore, this ink is simple to implement in any medium even those sensitive to temperature. The primer, meanwhile, is formulated to be photo-polymerized in order to prevent evaporation of volatile solvents during drying. It allows the surface properties of media to be adapted locally - smoothness, absorption property, surface energy and permeability – in order to make them compatible with the imperative demands of printed electronics. This innovative solution greatly expands the range of media used for printing conductive patterns (paper, cardboard …) and allows the integration of intelligent components directly on any media packaging and even on materials in 3D to be considered. The Poly-Ink products have applications in the security market with the printing of conductive patterns to protect and authenticate paper media (paper money, passports, tickets,...). 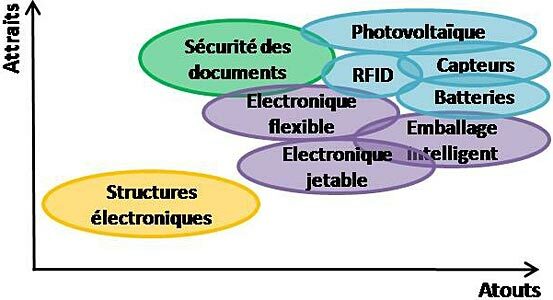 They can also be used in the printing of electronic smart structures: RFID antennas, solar cells, light emitting diodes (OLED), batteries, sensors, etc. With this partnership dedicated to the creation of an innovative young start-up, Grenoble INP-Pagora is directly involved in the industrial implementation of the results of innovative research performed in its laboratory.